How old are Grace Dieu’s trees?! 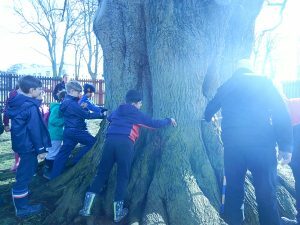 Year 5 got together for Outdoor Learning and went looking for veteran trees around our grounds. Armed with a ball of string and a metre stick to measure the circumference of the trees, we started in Nursery, where we found a lime tree, identifiable thanks to its red buds; with a girth of 574 cm, it worked out to be 287 years old as we know that a tree grows roughly two centimetres fatter every year. Not a bad start! 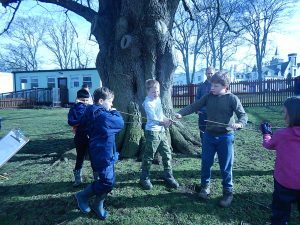 Guided by Andrew Bell, our Head of Grounds and resident tree expert, we continued our investigations. 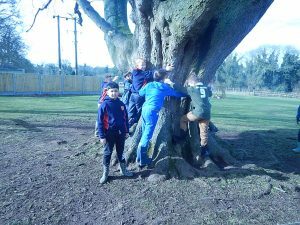 The sycamore on the Chapel playground is 535 cm or 7 hugs, age: 265. 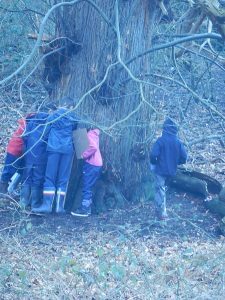 We carried on to the SSSI, which delighted the children, where we found two old fat trees: a sweet chestnut aged 222 and an oak aged 263. 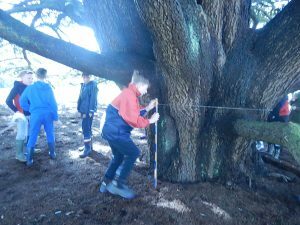 The oldest tree we recorded is on the Headmistress’s lawn; the majestic cedar tree measured 652 cm, making it 326 years old! 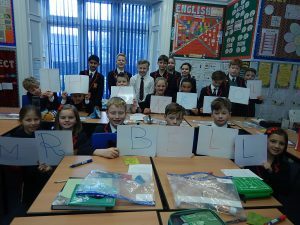 Thank you to Mr Bell for taking the time out of his busy schedule and to share his amazing knowledge with the children.